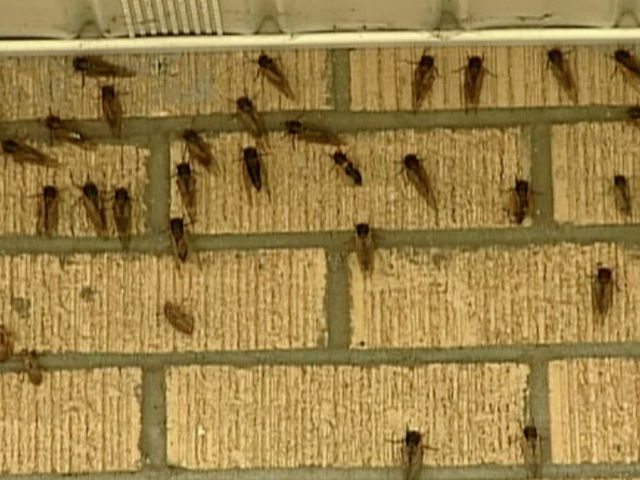 VIDEO: Remember the Cicada invasion of 2004? WATCH the Cicada Invasion of 2004 in the video player above. CINCINNATI – Experiencing an invasion of 17-year cicadas is a rite of passage in the Tri-State. You haven't really lived until you walk into a swarm of the ugly, red-eyed flying insects, feel them in your hair or on your skin, hear their incessant singing, see hordes of them climbing your trees or the sides of your house, or hear the crunch as you step on them while walking through the grass. You don't want to walk in bare feet, plan an outdoor wedding or picnic, or cut the grass, run or play golf at peak hours of the day during a cicada invasion. The wide-eyed insects are crazy fliers, and they might fly into your face, your shirt or even your mouth. Luckily, I guess, the nearest brood emerging from the ground this year - right about now - is in eastern Ohio and western West Virginia. 1. Some people are scared to death of cicadas. They don't bite, sting or carry disease. They don't eat flowers or plants. So what's the fuss? Just the idea of millions of insects flying around, landing in your hair or on your skin, is enough to freak out some people and keep them indoors. In 2004, a psychologist invited people downtown to talk about their fears, and 50 showed up. One of them was Eva Johnson: "They don't really swarm early in the morning, so I set my alarm at 6. I have to be at work at 9, but I got there at 7:30 today," she said. "Just being around people that are sick like me, it helps a lot." Cicadas pop out of the ground after the soil temperature exceeds 64º F, usually in late May, and live above ground for about three weeks. First, they shed their skins, then it works like in a singles bar. Males produce mating calls to attract females, and females snap their wings to tell males they can approach. Only male cicadas sing. They have sound-producing structures called tymbals on either side of the abdomen. After mating, females cut a slit in tree branches and lay about 600 eggs. Eggs hatch into nymphs that drop and burrow into the ground. They feed off tree roots and live underground for 13 or 17 years when it's time for them to repeat the process. The cicada invasion lasts about six weeks and then they're gone, and peace and quiet returns to your neighborhood. 3. One of the world's foremost experts on cicadas lives right here. Dr. Gene Kritsky, biology professor at Mount St. Joseph University, is the go-to guy for information about cicadas. He has studied them for decades and confirmed the existence of 13- year cicadas. Previously, it was thought that all broods emerged every 17 years. It's like Christmas for Kritsky when the cicadas show up. 4. "Daddy, why are there so many cicadas in our yard and on our trees?" It's nature's way of ensuring that the species survives natural predators like birds, squirrels and other wildlife, not to mention lawn mowers and people stepping on them and trying to squish as many as they can. "They literally come out in billions. Millions are eaten, but there are still millions left to reproduce," Kritsky says. 7. People eat cicadas, too. Yes, they do. In 2004, you could buy cicada pizza, cicada ice cream, cicada cookies, cicada pasta, cicada you-name-it. "Periodical cicadas are best eaten when they are still white, and they taste like cold, canned asparagus," Kritsky says. "Like all insects, cicadas have a good balance of vitamins, are low in fat, and, especially the females, are high in protein. 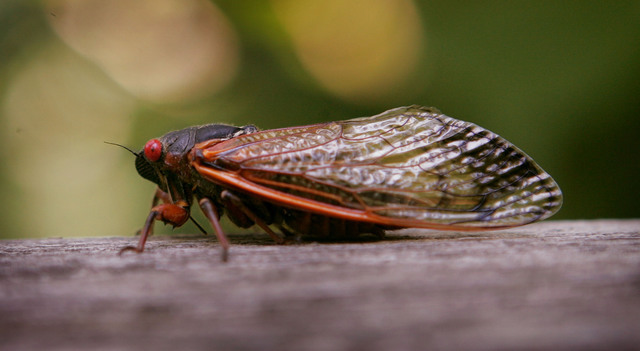 Native Americans and early settlers ate cicadas, history shows. 6. Cicadas are attracted to whirring machinery. They hear lawn mowers and power tools and fly to them as if they were a swarm of cicadas. "They don't bother me that much," said homeowner George Dunlap in 2004. "Working outside you get used to them. They bang into your head, get in your shirt and stuff like that." 7. Cicadas will come into your house without knocking. Just leave the windows or door open and see. They'll also fly into your chimney and attic. Dunlap discovered that the hard way when his water heater stopped working. 8. Annual cicadas vs. periodical cicadas. Some cicadas are not on a 13- or 17-year cycle. Kritsky predicts that a small number of annual cicadas will emerge in Hyde Park, Anderson Township and Mount Healthy in 2017. 9. Some cicadas can't count. In 2000, Kritsky correctly predicted that thousands of periodical cicadas would emerge four years early, based on collections of 17-year cicada nymphs from underground. So you'd better BOLO. SEE previous From The Vault videos and stories.